Solar Panels were installed on the Support Techs building at 1 E. Benton St. in downtown Aurora. Dan Schmidt of Rethink Electric secures American-made 300 watt solar modules to racks held in place with concrete ballast blocks. Photo by Joshua Schultz courtesy of GreenLife Media Group. Local collaborators are celebrating the power of the sun in the “City of Lights” with the completion of a state-of-the-art solar energy generation project in downtown Aurora. In December, a new 56.7 kilowatt (kW) solar power system was installed on the rooftop of the 113-year-old Carnegie library building at 1 E. Benton St., the former home of Aurora’s Main Public Library and now home to Support Techs. This renewable energy system is the first of its kind in Aurora’s historic downtown business district on Stolp Island. 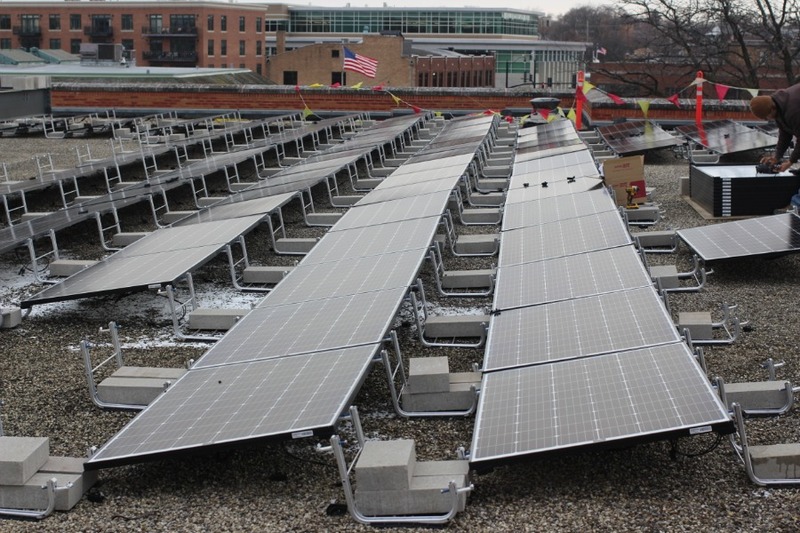 After acquiring the former Aurora Public Library building in December 2015, owners of The Support Companies researched ways to reduce operating costs while “going green.” This solar solution was selected to reduce CO2 emissions, reduce dependency on utility companies, and reduce costs over the long term. The new solar photovoltaic (PV) system is projected to reduce 58.72 tons of carbon emissions per year by generating 71,615 kilowatt-hours (kWh) of electricity in 2018. The entire project took less than two months to complete. Michelle Knox, owner of WindSolarUSA designed the rooftop system to feature American-made products. Installation teams from local solar professionals at Rethink Electric in Geneva completed the project ahead of schedule. “The city of Aurora’s Building and Permits department was instrumental in making this project a reality. Their advice and efficient processes helped us meet our tight December deadline,” Knox said. “This was a collaborative effort,” she added. 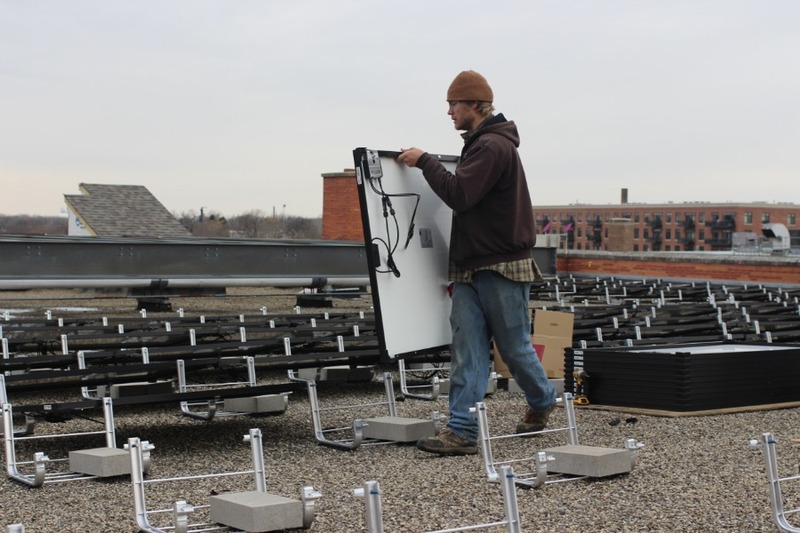 Economic advantages of the rooftop system include positive cash flow of $98,285 generated over the life of the system, a 30% federal tax credit, State of Illinois Renewable Energy Credits, and the Modified Accelerated Cost Recovery System (MACRS). Solar project developers like WindSolarUSA are responsible for understanding current incentives and educating owners throughout the design and installation process. Th 56.7 kw solar power system on the roof of Support Techs has a payback period of 4.7 years, providing decades of free energy. Photo by Joshua Schultz courtesy of GreenLife Media Group. American-made products chosen for the installation include 189 SolarWorld 300 watt photovoltaic modules and a Unirac ballasted system. A plus was that no penetrations were required to the building’s roof. An expansion to increase the system size by another 25% is in the planning phase. “With new products available today, installations occur faster and more reliably,” said Rethink Electric owner Mike Nicolosi. “Cutting installation costs reduces reliance on purchased power and increases return on investment,” Nicolosi said. Rethink Electric installs alternative energy systems of every scale. “The price of solar has dropped over 60% in the last ten years,” said Rebekah Axtell, a local grassroots community organizer. “This project proves it’s definitely worth the time to stay updated as renewable energy and technology markets evolve,” she added. Axtell invited Knox and Illinois Solar Energy Association educators to speak at Eco-Week events, which she co-hosted June 2015 in conjunction with Aurora Greenfest. “Transitioning to renewable energy technologies while preserving meaningful community architecture is a two-fold investment in the quality of life for future generations,” Axtell said. The system went live on Dec. 21, Winter Solstice, the shortest day and longest night of the year. Now as the days grow longer, the sun is helping to power bright new initiatives in this historic building. In the lower level once known as the library’s “Young People’s Department,“ a community arts and culture space, Gallery 1904, opened recently. It is aptly named after the year the Carnegie library first opened. Gallery 1904 is open monthly to the public for downtown Aurora’s First Fridays events. Opportunities for group tours of the new solar power installation will be announced in spring 2018 on www.auroradowntown.org. Solar Renewable Energy Forum will be held on Thursday, Jan. 18 from 1 to 3:30 p.m. at Waubonsee Community College 18 S. River Street, Room 160AC, downtown Aurora. Topics include the Future Energy Jobs Act (FEJA) and Solar Models Overview – SolSmart, Rooftop, Community Solar, and Utility-Scale. RSVP at www.foxvalleysustainabilitynetwork.com.